1. The shines give the eyes an amazing dept. It caught my eye even as a thumbnail! 2. I really should have paid more attention to the detail of your eyes in your manga. They really are full of these little details with beautiful lines and colors. 3. They fact that you made it lighter by using a lighter color is amazing. I know it's so simple but it fits perfectly. 4. LOVE the hatching on the top of the eyes. Without it, the eye would look a little boring. Thank you infinity. You always give such nice comments. 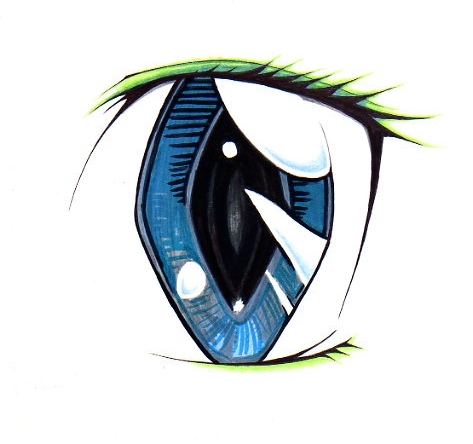 I used a cheap pen and Artwin marker for the eyelashes, then the same marker for the eye. Maybe I should do another eye. I'm going to go fave you now. very pretty and you put so much detail into it!!! i love the colors!! !